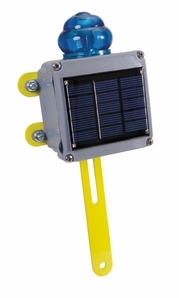 Solar-powered blue flashing light includes mounting bracket to attach to any square or flat sign holder. Shock proof and NEMA-4X rain and dust proof. Gravity switch (light turns off at 45° angle). Note that the mounting bracket for attaching to a derail sign holder is shortened. Please indicate above if you will be mounting the light on a derail or a standard sign holder.